WARNING! Lots of pictures and nerdy space commentary ahead! Proceed with caution! Today we went on a "replica" tour of the tour the Augustine Commission was taken on a few weeks ago. For those who don't know what the Augustine Committee is, let me explain briefly! 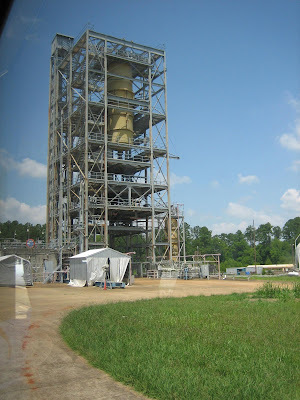 The "Review of United States Human Space Flight Plans" is to examine ongoing and planned National Aeronautics and Space Administration (NASA) development activities, as well as potential alternatives, and present options for advancing a safe, innovative, affordable, and sustainable human space flight program in the years following Space Shuttle retirement. So, basically the committee is reviewing NASA's current direction to make sure it matches with the goals set forth by the United States. 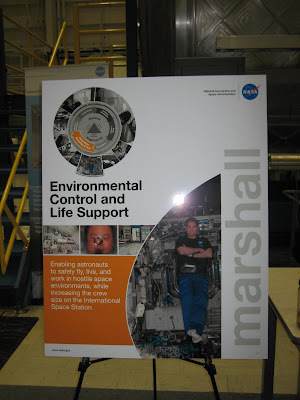 At any rate, the committee came to Huntsville a few weeks ago to get a basic understanding of Marshall's role in Human Space Flight activities, this is the tour we got to go on today. 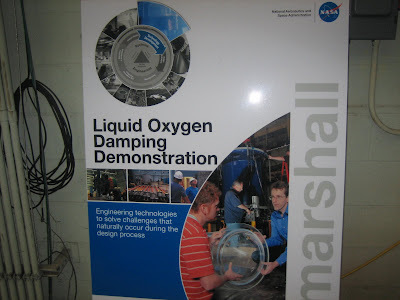 After a brief introduction, we drove to see the Liquid Oxygen Damping Demonstration. 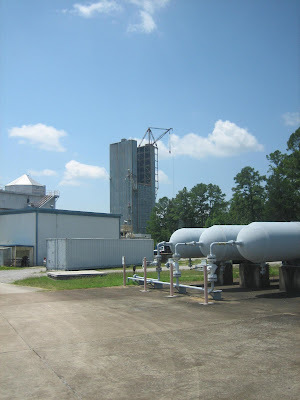 Because Ares-1 is an inline vehicle which includes a Solid Rocket Motor there have been problems with significant "sloshing" in the fuel tanks of the Upper Stage. 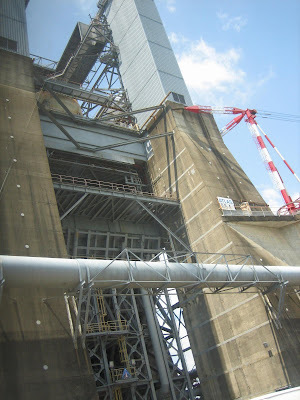 This group designed a device to damp out this vibration induced sloshing. 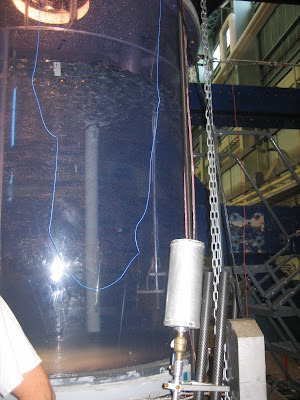 Here is a picture of one of their test tanks! 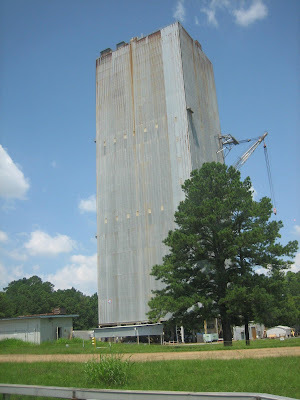 Next we visited a building where advanced composite materials were engineered and tested. 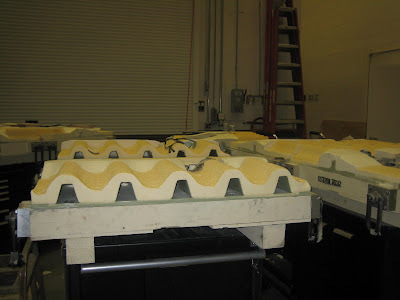 This facility also had a SOFI cell, which stands for "Spray On Foam Insulation". 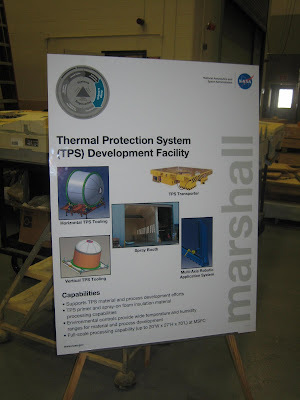 This is the foam that is sprayed on the External Tank (aka: the big orange thing!). 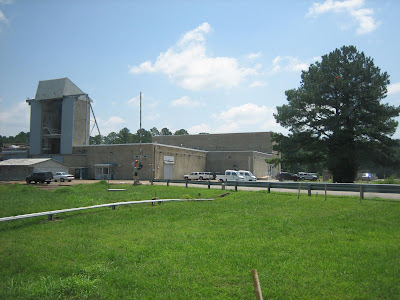 The next facility was extremely interesting! 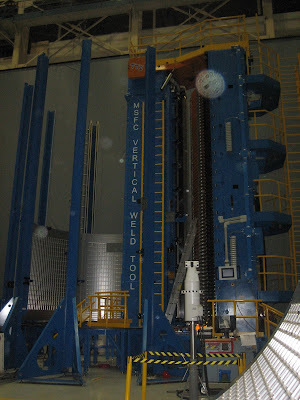 It housed some of the largest welding tools in the world! 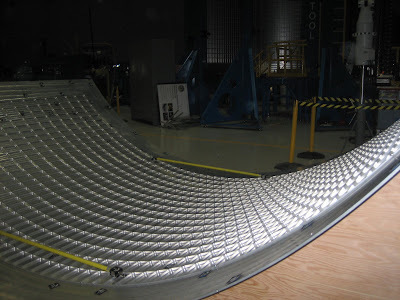 This first picture is a piece of one of the fuel tanks on the Upper Stage of Ares-1. 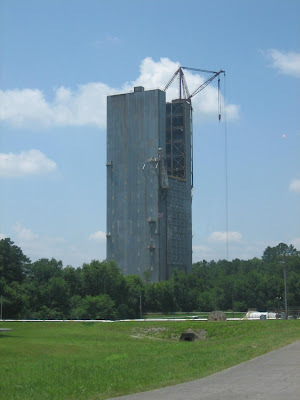 Here is a picture of the MSFC Vertical Weld Tool. It is huge!!!! 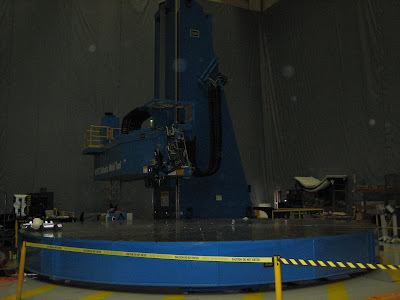 This facility is known for its work in "Friction Stir Welding". 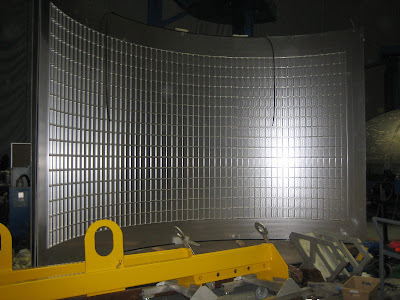 Basically, unlike conventional welding the metal is not "melted", in fact it only reaches approximately 80% of its melting value. They gave us each a sample of a friction stir weld piece to keep! 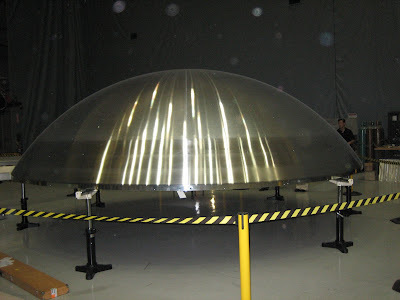 More sections of Upper Stage Ares-1 Fuel Tanks. 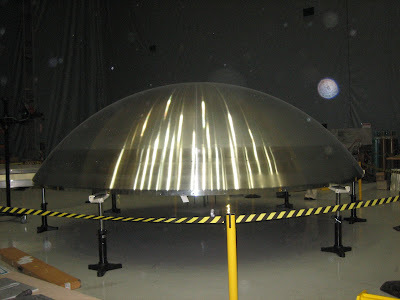 Here is a couple pictures of one of the tank domes (I believe this is the dome for the upper tank which has liquid Hydrogen in it, since it doesn't appear to be the common bulkhead dome). 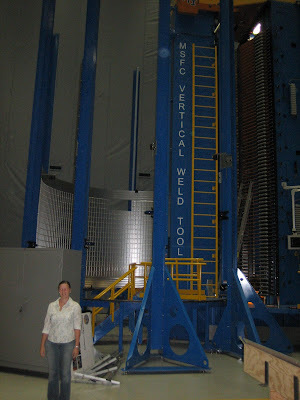 Here is a picture of me standing next to the MSFC Vertical Weld Tool so that you can get some sense of its size! Here is another welding machine, comparable in size to the Vertical Weld Tool. 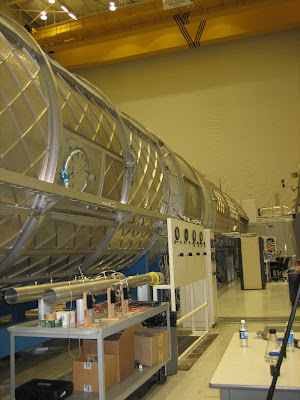 Next we saw some International Space Station equipment! 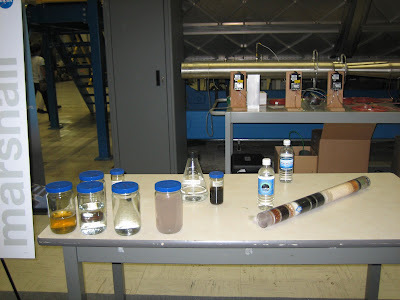 Below is a demonstration of the different types of liquid (i.e. 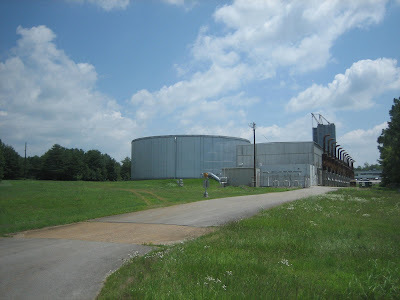 pee, gray watere, sweat) that are combined and filtered into pure drinking water (kinda gross!! especially when the guy was sloshing around the pee jar). 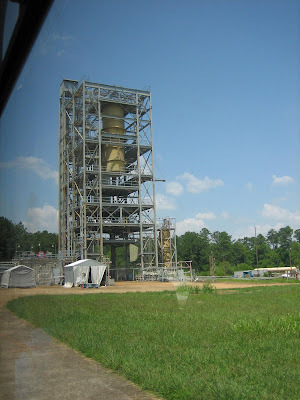 This facility also had a full mock up of part of the ISS which they used to test their urine/gray water/sweat collection and filtration system. 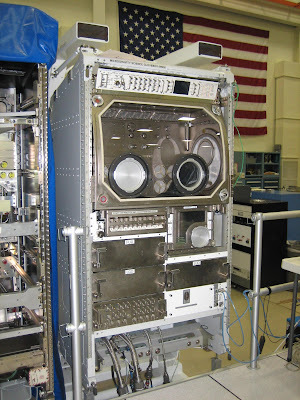 Next we saw some equipment currently on the ISS. 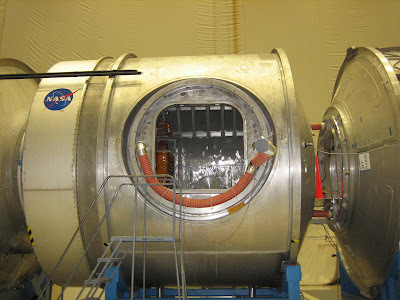 The picture below shows a full-simulation Microgravity Science Glovebox which engineers use to test payloads and experiments before they fly in space! 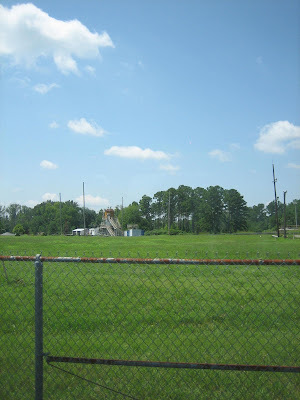 The following set of several picturer show test stands, both historical and in use today! 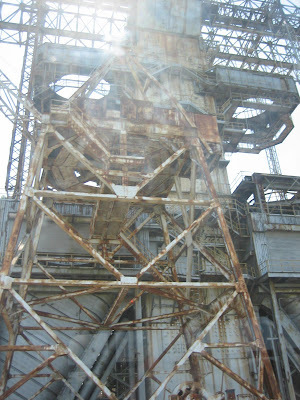 Heritage piece of the Saturn 1-B and 1/16th model of the shuttle, used on test stand 116. 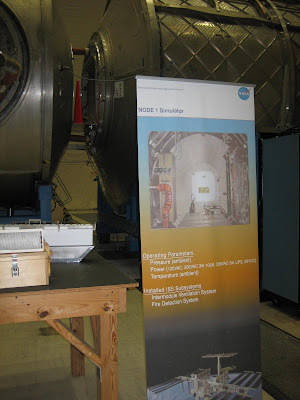 Interesting side note: the mini shuttle used Tomahak missiles to represent the SRBs. 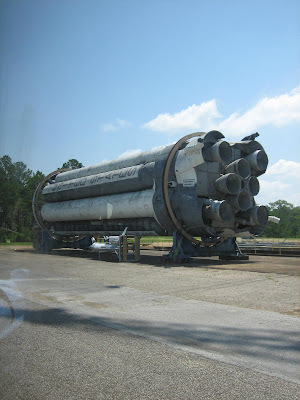 During one of the tests, one of these missiles actually came unattached and fired off into the woods! 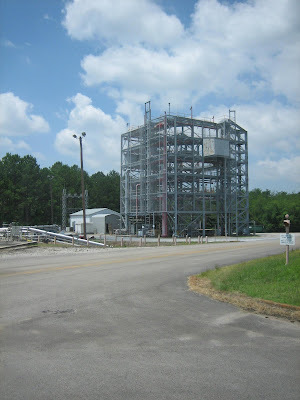 This test stand was recently used to test the J-2X engine, if I remember correctly! The Big Kahuna! 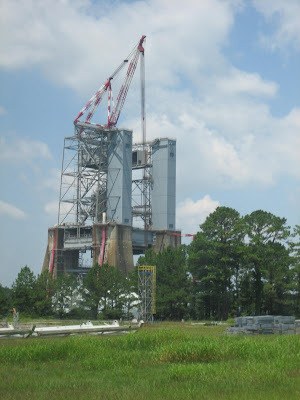 This test stand was used in Saturn, Shuttle and soon, Ares. 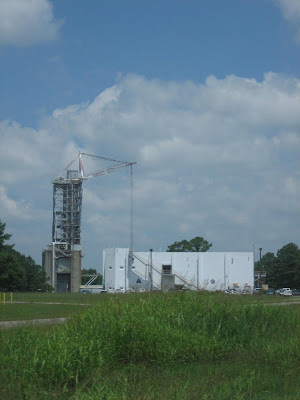 It is used to test the "full stack" (which means, the entire rocket!) 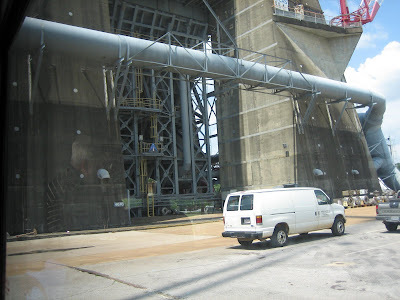 for ground vibration (i.e. 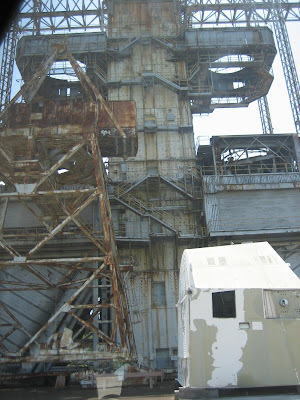 moving the rocket out to the launch pad) and some in-flight vibration. 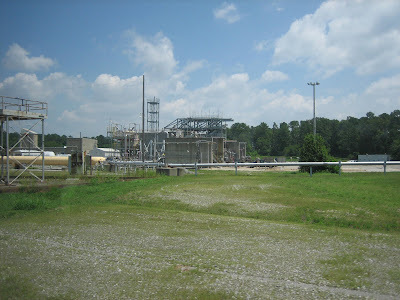 Ares-1 will be tested here in 2012! I wish I could see that! 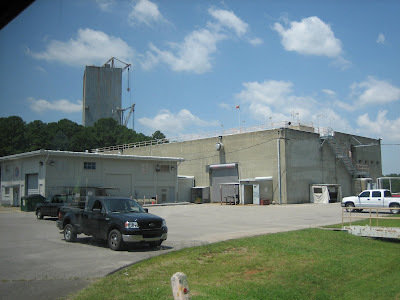 There are 16 train locomotive engines in this building to pump water to the test stands! 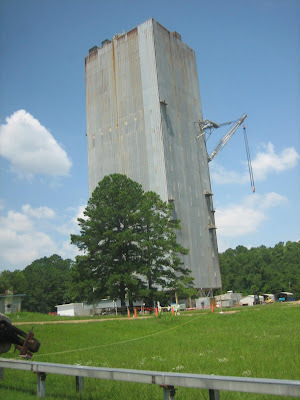 This test stand will be used for J-2X soon and was also the site of the famous X-33 engine tank explosion (which ultimately ended the program). 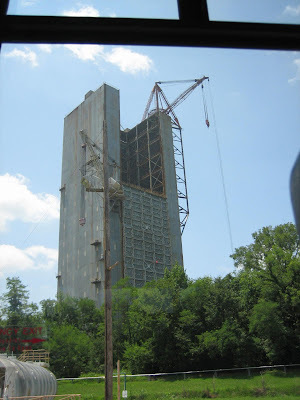 It was a great tour and I am so glad I was able to see this much of the Marshall Space Flight Center!